Why Donate to "Paws & Hearts" Animal Assisted Therapy? Why donate to "Paws & Hearts" Animal Assisted Therapy? What sets our organization apart from all the others in the valley? Good questions. First of all, "Paws & Hearts" Animal Assisted Therapy only has one program and very simply put, all of our energy and funding goes into our mission statement of providing therapy dogs to local hospitals, long-term care facilities, cancer centers and Alzheimer's facilities. Quite often when a donor donates to a large multi-level agency it is not always clear what the donation is used for. With us, there is only one program and our donors can rest assured that their generous donation goes towards the visits. So the next time you, the donor, are out in the valley and you see one of our volunteers in the "Paws & Hearts" Animal Assisted Therapy white polo shirt taking their Canine Ambassador into a facility, be proud that your donation has made that visit possible and that you are ensuring the future of our little organization! Click on the button below to print a donation form or donate through PayPal. 2) On the top click register and fill out the information. You will need to create a log in ID and password. It is free. 3) After you register, click advanced search and type in these three words: Paws and Hearts. Then click okay or go. Once you are on the page you can click on any link to learn different things about the company. Consider leaving us a lasting legacy so that "Paws & Hearts" Animal Assisted Therapy can continue providing Animal Assisted Therapy visits for many life-times to come. The benefits of a charitable bequest is a bequest written in a will or trust that directs a gift to be made to "Paws & Hearts" Animal Assisted Therapy when you pass away. One benefit of a charitable bequest is that it enables you, the donor, to further the good work of our Canine Ambassadors long after you are gone. If you or your loved ones have greatly benefited from our visits, consider what your donation will mean to other patients and families. 760-836-1406 to discuss the various methods of leaving a legacy in your name. and keep this thought in everyone's mind. As an organization we continue to grow and mature and have begun to consider long-range financial plans for "Paws & Hearts Animal Assisted Therapy." Producing an annual dog walk is one way of collecting donations, but for a non-profit to become solid, having funds invested over the long-term ensures continued growth. Whichever route a donor chooses, he or she should always consult their financial advisor first. Tax benefits are available if funds are given while the donor is still living. And keep in mind that once you become a long-term donor you will be forever part of our Legacy Society, and recognized with special attention at events. Just imagine our first Legacy Society tea! "Paws & Hearts" intends to be here for generations to come, and as we move forward one of our goals is to establish ourselves with a secure financial base. This is something to which each and every one of you can lend a hand in! 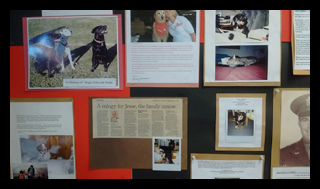 At "Paws & Hearts" Animal Assisted Therapy we offer a new slant on donations in memory of. 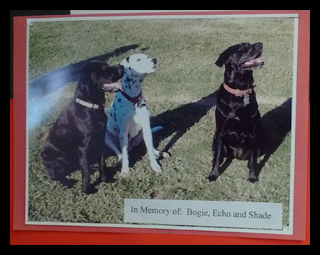 We have the standard memorial donation, which if you make a donation in the name of a family member or pet and provide us with a picture; we will include the picture on our Memorial Wall and send a letter of acknowledgment to the family. 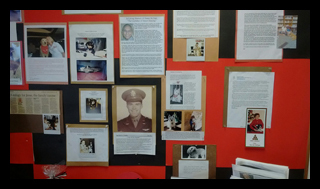 In addition to posting the picture on our Memorial Wall, we will begin posting the pictures right here on our website in our Memorial Section. Actually this idea was inspired by our most recent memorial donors, Andy and Tony Marefos, Drew's brothers. You'll see the picture of their three dogs. Andy asked if the picture could be featured on our website and it sparked an idea for us! Thanks for the suggestion Andy. 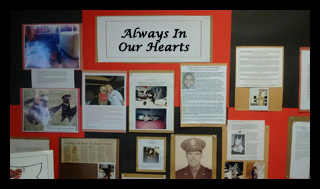 We will always have the Memorial Wall in the office and will continue to add to it. And at the donors request will include a picture and information on the site. We have come up with a fun way to honor family and friends. Most people who celebrate birthdays and anniversaries don't want gifts, but would rather have a donation made in their name. Consider making the donation to "Paws & Hearts" Animal Assisted Therapy. We will send out an acknowledgment letter to inform the recipient of your generosity on their behalf. A great tax deductible way to give a gift!